HCJ 9212/18, Ibrahim Rashid Ahmad Alam et al. v. Nehama Zussman of the State Attorney’s Office Appeals Department et al. Ibrahim Alam, a resident of the Palestinian village of Thulth, and Yesh Din, petitioned to the High Court of Justice (HCJ) against the head of the State Attorney’s Office Appeals Department, and against the Israel Police’s Samaria District, demandingthat the investigation file following the illegal paving of a road in Alam’s land be reopened and a more exhaustive investigation launched, including examining the involvement of the Ma’ale Shomron Civilian Security Coordinator (CSC). 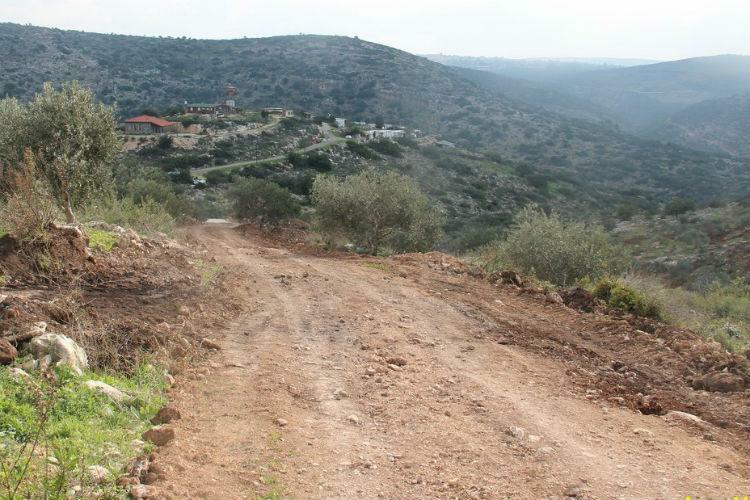 In December 2014, Alam discovered that a new road was being paved in his land, aiming to connect El Matan (an unauthorized outpost at the time) and the settlement of Ma’ale Shomron. The road-building was carried out unlawfully through trespassing onto Alam’s private land. Following the incident, and due to the damage caused to olive trees planted on the plot; to the water cistern located on site; and to the land itself resulting from the use of heavy machinery, Alam filed a complaint with the police. According to Alam’s testimony to the police, the Ma’ale Shomron CSC played an active role in paving the new road. The CSC even gave instructions to the soldiers onsite and secured the illegal activity. A CSC is a civilian position with limited security authorities delegated by the commander of IDF forces in the West Bank. (For more information on CSCs, see Yesh Din’s Report, The Lawless Zone). The police investigation file was closed 18 months later without any substantive investigation having been conducted. As a result, with the assistance of Yesh Din, Alam filed an appeal against the decision to close the file, in which both the decision to close it, and the grounds on which it was closed for – “no criminal culpability” – were criticized. The central claims made in the appeal point to the significant investigative failures throughout the case. After several months in which we tried to clarify the fate of the appeal, the police announced that the investigation file had been transferred to the Military Police Criminal Investigation Division (MPCID). Our attempts to understand why the case was transferred to the MPCID — a body responsible for investigating soldiers and not civilians — bore no fruit. Moreover, the Samaria District police even provided misleading and erroneous information when they claimed that the MPCID, and not the police, have the authority to investigate CSCs – an entirely false claim. As previously noted, CSCs civilians and, therefore, the body responsible for investigating any criminal offenses committed by CSCs has always been, and remains, the Israel Police. Following this sequence of events, we requested to review the content of the investigation in order to examine the possibility of filing an appeal against the decision to close the investigation file with the police. This request, like the remainder of our requests, was left unanswered. Yet, in a telephone conversation, the Samaria District Police Chief Superintendent Gil Desheh stated that, “the police did not carry out any investigative actions into the case after the appeal was filed.” Superintendent Desheh also saw fit to note that all of our letters end up in the trash can. As a result, we filed an additional appeal against the decision to close the police investigation file without additional investigative activities carried out to establish a factual basis regarding the CSC’s involvement in paving the road. The police refused to address the appeal, or to even act in accordance with regulations in transferring it to the State Attorney’s Office Appeals Department. As a result, we were atypically compelled to turn directly to the appeals department, which ultimately announced that it had decided to reject the appeal and not order the police to reopen the investigation. The appeals department’s decision made no reference to the many claims raised in our appeal, especially the central claim that the file was closed without any investigation whatsoever. The appeals department concluded that “the incident is of a civilian nature, which is both appropriate and acceptable to clarify […] within a civilian framework,” and that there is no room to continue to address it as a criminal proceeding. Following the response of the appeals department, on December 30, 2018, we petitioned the HCJ against the police’s decision not to investigate the involvement of the CSC in the paving of the road, and the State Attorney’s Office Appeals Department’s decision to reject the appeal filed against the closure of the investigation. The petition’s main claim asserted that it is not acceptable to close an investigation file without any factual basis, which may solely be formulated through conducting an investigation. Regarding the rejection of the appeal, we claimed that the decision to do so without referring to our central claim that an investigation was not conducted, and on the grounds that the incident was civil and not criminal, is clearly unreasonable.